What Does the Google+ Shutdown Mean For My Business? The good news is that the Google+ shutdown should have virtually no effect on your business, as the platform had historically low usage and engagement. While Google+ was developed to become a popular social network like Facebook or Instagram, it never became as widespread with consumers. In fact, in their Oct 8 blog post, Google reported that Google+ user sessions lasted less than five seconds on average. In short, don’t worry that Google+ is going away—it gives you time to focus on more active social media platforms. The Google+ shutdown will have no affect on your website unless you have the G+ icon listed as one of your social media icons. If this is the case, make sure to remove your G+ button on your website sometime within the next nine months. If you are unsure how to do so, call Mannix to help. Currently, nothing is in the works to replace Google+, but there is another Google platform you should be focusing your efforts on: Google My Business. GMB is the information listing that pops up the right side of your screen when you search for a business. It helps give your business a public identity and local visibility on Google Search and Google Maps. Your Google My Business listing displays your business’s address, hours of operation, phone number and reviews. You can further optimize your listing for your benefit by posting a description, photos, special offers and more, but in order to do so, you must first claim and verify your local business’ Google My Business listing. Need help setting up your Google My Business listing? 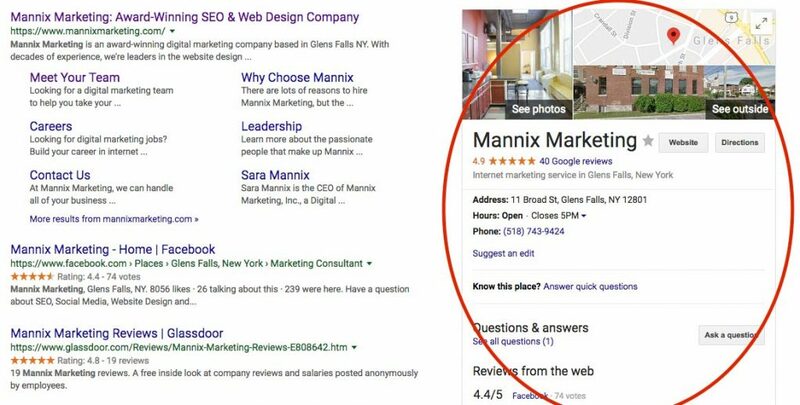 Mannix offers this service as part of our Local SEO services. Do I Have to Shutdown My Google+ Account? You don’t have to worry about shutting down your Google+ account yourself, as come August, Google will remove it automatically. Google has reported they will provide consumers with additional information on ways they can download and migrate their Google+ data over the next coming months. If you wish to delete your account sooner, you can do so through the Settings tab of your Google+ profile. Set Up Your Google My Business Listing Today! While it may come as a surprise that the Google+ platform is shutting down, this comes after a history of low user activity, so your business’s social media presence will not suffer. Take this opportunity to update your website’s social media icons and claim and optimize your Google My Business listing! Need help getting your business set up on Google My Business? Have additional questions or concerns about the Google+ shutdown? Contact our team of digital marketing strategists today and we’d be happy to help you! Get in touch with us here, or give us a call at 518-743-9424!